This plot shows the current extent and position of the auroral oval in the southern hemisphere, extrapolated from measurements taken during the most recent polar pass of the NOAA POES satellite. This presentation provides an estimate of the location, extent, and intensity of aurora on a global basis. For example, the presentation gives a guide to the possibility that the aurora is located near a given location in the southern hemisphere under the conditions that existed at the time of the most recent polar satellite pass. 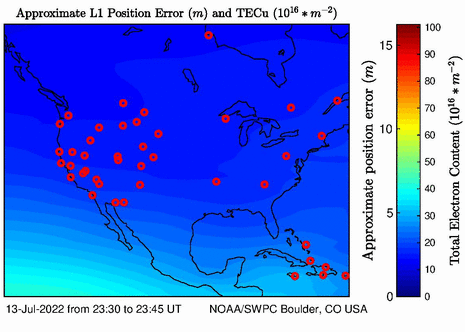 When displayed in geographic coordinates, the statistical patterns of auroral particle power input provide a "best-guess" estimate of the locations, geographic extents, and intensities of aurora at the time of the satellite pass that provided the estimate of auroral activity. 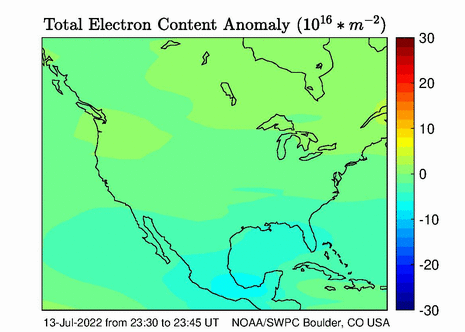 Energetic auroral particles (primarily electrons) not only produce the visible aurora but also greatly influence the properties of the ionosphere and are connected with strong electrical currents (as much as several million amperes) that flow in the ionosphere and connect along the geomagnetic field to dynamo processes at high altitude in the magnetosphere. 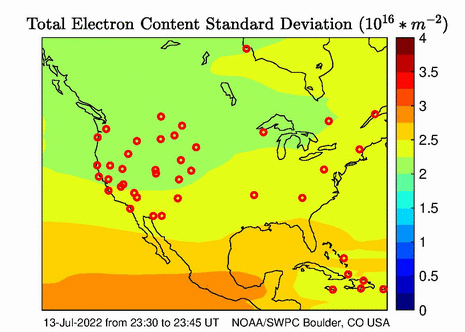 Thus, this same display provides a similar "best-guess" estimate of the geographic locations that may be subject to geomagnetic fluctuations that result from electrical currents flowing in the ionosphere, or the radio propagation paths that may be degraded because of increased absorption of the radio signal by the disturbed ionosphere.